UPDATES ARE OFF. Thank you everyone for tuning in. 8:23 AM: 1,255,000 ballots counted. It's practically over. The percentages haven't changed. QP (Nikol Pashinyan) makes massive gains. From 9 seats to around 67. Bright Armenia (Edmon Marukyan, QP's ally) gains >10 seats. Menq (Aram Sargsyan, QP ally) did not make it. Menq + Bright Armenia + QP = Way Out (aka Yelq) Alliance, which de facto no longer exists because they split into different parties for these elections. BHK (Gagik Tsarukyan) takes heavy hits and drops from 31 to >10 seats. ARF (Dashnaks) lose all of 7 seats and are out of Parliament. HHK (Sargsyan, Shawarmazanov, Ashotyan) appears to be also out. They are 3,500 votes short of reaching the 5% threshold. Their total vote count is 59,059. To get the additional 3,500 votes through a recount or error correction would mean a 6% correction in their favor. Margin of error is rarely that big after recounts. This means the current largest party is also out. 6:23 AM: Almost done counting. Out of 1,229,684 counted ballots, QP 70.5%, BHK 8.3%, Bright Armenia 6.4%, HHK 4.7% (almost RIP), ARF 3.9% (RIP). Parties must pass 5% threshold to enter the Parliament. Because HHK is quite close to 5%, they will most likely challenge the results to achieve a recount or other "error corrections". 3:46 AM: With 65% of ballots counted: QP 70.3%, BHK 8.4, Bright Armenia 6.4, HHK 4.5, ARF 4%. 3:04 AM: 46% ballots counted: QP 70.2%, BHK 8.3, Bright Armenia 6.4, HHK 4.4, ARF 4.3. "որոնք ստացել են կողմ քվեարկված քվեաթերթիկների ընդհանուր թվի և անճշտությունների թվի գումարիկուսակցության դեպքում 5, իսկ կուսակցությունների դաշինքի դեպքում` 7 տոկոս կողմ քվեարկված քվեաթերթիկներ"
I do not know what the "error number" means in this case, but it appears that >4% vote isn't actually "rounded up" to 5% automatically. With 25% of ballots counted: QP 70%, BHK 8.5%, Bright 6.5%, ARF 4.5%, HHK 4.2%. All the parties would pass, if I understood FactorTV correctly. 1:31 AM: 18% of ballots counted with 553 precincts reporting in. ARF has now fallen slightly below the required 5% threshold. QP 70%, BHK 8.8%, Bright Armenia 6.2%, ARF 4.9%, HHK 3.9%. 1:10 AM: with 14% of ballots counted, QP 70%, BHK 9%, Bright Armenia 6%, ARF 5.1%, HHK 3.9%. HHK's chances have gone down slightly since the last update. A party needs 5% to enter Parliament. 12:54 AM: Out of 50 Vanadzor penitentiary inmates, 49 voted QP (98%) and 1 for BHK (2%). 12:50 AM: The numbers are coming in faster now. This thread will be updated soon, when a more significant percentage of ballots are counted. The picture hasn't changed compared to 12:02 AM. 12:02 AM: 3% of the votes have been officially counted. QP 67%, BHK 11%, Bright Armenia 6.3%, ARF 6.3%, HHK 4%. If the current results hold up - QP, BHK, ARF and Bright Armenia will pass. A party needs at least 5% of the votes to qualify for seats, which HHK does not have at the moment. There is no maximum limit on the number of parties that can qualify, so if HHK can chew away some of the future QP numbers and cross the 5% threshold, they could become the 5th party in the Parliament. These are very early numbers and expect things to change. In general, it looks like HHK will make it in the Parliament. The counting still continues and things can change, though. 9:13 PM: Parliamentary election turnout was 49% (could be updated later), higher than the 44% turnout during Yerevan mayor's elections. Some have argued that the real turnout is bigger because the true number of eligible voters is lower than 2.55mln because that number includes some residents who emigrated in past and became citizens of other nations. Bright Armenia (QP allies) is getting a lot of votes. 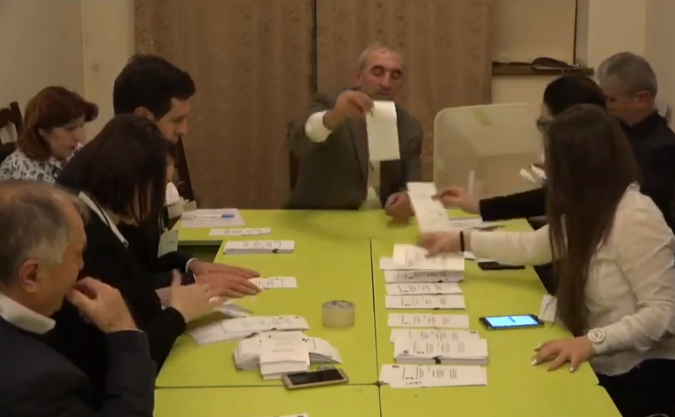 QP is not going to have the same 80% as in Yerevan elections if these results continue, but this is one station and the beginning of the count. 8:14 PM: Election officials re reading the rules for the ballot counters, and checking the validity of stamps. The counting process is about to begin. 8:00 PM: Voting ends now. The results will be gradually counted and published later. 7:50 PM: BHK's Naira Zohrabyan says she has received reports that Syunik's governor was asking staff to vote for QP. Incident Reports: In one one the voting locations, voters are unable to vote for QP because the party's ballot #4 is missing from the stack. (A voter decides which party to vote for, takes the corresponding ballot, marks and drops it in a box.) The voting process was temporarily suspended until the ballots were supplied. A similar incident happened with Christian-Democratic party ballots in another location. This page was last edited on 24 December 2018, at 06:30.